Within the framework of the European Maritime Day 2013, the Mediterranean Information Office for Environment, Culture and Sustainable Development (MIO-ECSDE) in cooperation with the EU funded Horizon 2020 Capacity Building/Mediterranean Environment Programme and the MedPartnership organized a panel discussion on the opportunities but also the threats of sustainable tourism and ecotourism development in the Mediterranean. The discussions highlighted and focused on the concern related to the expansion of the tourism season, which seems to be one of the most common recommendations and is favoured uncritically. 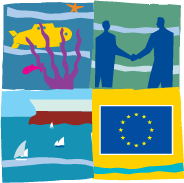 The European Maritime Day is celebrated every year in May, across the European Union to showcase the importance of the sea and oceans for our everyday life. This year, Valletta (Malta) hosted the 6th edition of the European Maritime Day Conference where 847 participants gathered to discuss the opportunities and challenges currently faced by maritime regions and sectors across Europe. The main focus of the conference was the theme of “Coastal development and sustainable maritime tourism”. The European Maritime Day 2013 was organised by the European Commission (DG for Maritime Affairs and Fisheries) in partnership with the Maltese Ministry for the Economy, Investment and Small Business, and the Maltese Ministry for Tourism. Ms. Beate Gminder, Head of Unit D.1 of DG MARE. Prof. Michael Scoullos, Chairman of the Mediterranean Information Office for Environment, Culture and Sustainable Development (MIO-ECSDE); University of Athens, Team Leader of Horizon 2020 Capacity Building/Mediterranean Environment Programme (H2020 CB/MEP). Mr. Gordon Sillence, Vice-President of ECOTRANS European Network for Sustainable Tourism Development. Mr. Paulo Augusto Lourenço Dias Nunes, Scientific Coordinator, Policy and Technical Expert Committee WAVES. Back-to-back with the European Maritime Day and within the framework of H2020 CB/MEP the Mediterranean Information Office for Environment, Culture and Sustainable Development (MIO-ECSDE) with contributions from ACR+, CP/RAC and UNESCO-IH organized an intensive training on Sustainable Tourism and Ecotourism in the Mediterranean in the wider context of Blue Growth: Challenges & Opportunities, 20-22 May 2013, Valetta, Malta with trainees from most Mediterranean countries (Read more here).